Folkmanis 3096 - Sweet and gentle, the Folkmanis� CAVALIER KING CHARLES SPANIEL puppet is the ideal lap dog. 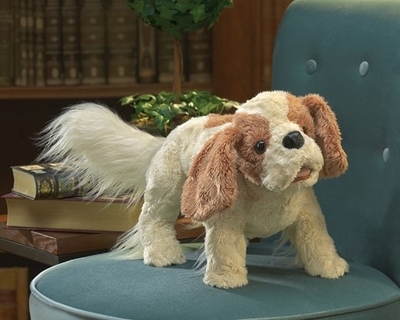 Animate mouth and forelegs to bring life to this chestnut and pearl colored pooch. Movable mouth and forelegs. Puppet measures 22� x 6� x 10�.